"Mr. Obama came into office telling us that capitalism didn’t work, and he wanted no part of it. “‘The market will take care of everything,’ they tell us . But here’s the problem: it doesn’t work. It has never worked. It didn’t work when it was tried in the decade before the Great Depression. It’s not what led to the incredible postwar booms of the ‘50s and ‘60s. And it didn’t work when we tried it during the last decade. I mean, understand, it’s not as if we haven’t tried this theory,” he said in a speech in Osawatomie, Kansas on Dec. 6, 2011. "But Mr. Obama is wrong. Everywhere it has been tried, it has not only worked, it has been a spectacular success. “In 1800, the total population in America was 5.3 million, life expectancy was 39, and the real gross domestic product per capita was $1,343 (in 2010 dollars),” writes James Otteson of New York’s Yeshiva University in a paper for the Manhattan Institute think tank. "By “2011, our population was 308 million, our life expectancy was 78, and our GDP per capita was $48,800. Thus, even while the population increased 58-fold, our life expectancy doubled, and our GDP per capita increased almost 36-fold,” Mr. Otteson continued. "Once in office, Mr. Obama admitted to colleagues, that he aspired to be “a transformational leader” like Reagan. "That was not going to happen, especially to someone who still believes that capitalism is a disproven theory." Source: his April 29, 2016 syndicated column, posted at The Washington Times. To read James Otteson's entire paper at the Manhattan Institute, click here. The Arlington Sun Gazette posted an online story this morning saying that Arlington County's "joblessness remains lowest in Commonwealth." "Despite a slight uptick from a month before, Arlington’s unemployment rate in March remained the lowest in the commonwealth. "With 142,020 county residents employed in the civilian workforce and 3,920 looking for work, the county’s jobless rate of 2.7 percent was up from 2.6 percent from February, according to figures reported April 27 by the Virginia Employment Commission. "The slight increase was part of a pattern across Northern Virginia, where most jurisdictions saw no change or a slight jump in joblessness. Unemployment increased from 2.8 percent to 2.9 percent in the city of Falls Church; was unchanged at 3 percent in Alexandria and unchanged at 3.2 percent in Loudoun County; and rose from 3.2 percent to 3.3 percent in Fairfax County. In Prince William County, the unemployment rate declined from 3.8 percent to 3.7 percent. "Across Northern Virginia, March’s jobless rate of 3.4 percent in March was unchanged from a month before, with 1.53 million employed in the civilian workforce and about 53,600 looking for work. Statewide, the unemployment rate declined from 4.3 percent to 4.2 percent, based on non-seasonally-adjusted figures. It will be most interesting to watch how those vacancy rates change between now and next year since the Arlington County Board just gave Arlington's Economic Development (AED) department $1.5 million in the process of adopting the FY 2017 budget, according to the April 19, 2016 press release, and "will be used to focus on lowering the commercial vacancy rate to support the commercial real estate market in Arlington." "The Board added $1.4 million to the Manager’s Proposed Budget to increase funding for economic development. $1,000,000 of that will be on-going funding, used to fund five new fulltime positions, support marketing activities, and expand support of the Columbia Pike Revitalization Organization. The rest will be for, travel, tourism, and TandemNSI, a public-private partnership to promote connections between Arlington-based high-tech firms and government." We've growled several times regarding economic development in Arlington County. Our November 27, 2015 Growls includes links to a couple of Growls that provide more extensive information about economic development. The importance of a strong economy that filled that office space was pointed out to delegates of the Arlington County Civic Federation. In speaking to delegates on March 3, 2015, the chair of the county's economic development commission pointed out that reducing the vacancy rate to 10% would increase annual revenues by $34 million. UPDATE (4/30/16): Title changed from "The Jobs Situation in Arlington County." "Negative or low interest rates from central bank actions misallocate capital from its highest and most productive uses, resulting in lower economic growth and job creation. The present madness began with the mistaken belief that monetary policy could be used to solve problems caused by too much government spending, taxation and regulation. At some point, there will not be enough savers to continue to agree to accept negative rates on their savings (after inflation) to support all of the government spending, and the game will be over. And those responsible for the madness will blame others." Source: his Tuesday, April 26, 2016 column, posted at the Washington Times. "People have the right to take chances with their own lives. People do not have a right to take chances with the lives of others. That is why laws that mandate that cars have brakes are consistent with liberty and seat belt laws are not. You might say, "Aha, Williams, we've got you there because if you don't wear a seat belt and you have an accident and turn into a vegetable, society is burdened with taking care of you!" That's not a problem of liberty. It's a problem of socialism. Nobody should be forced to take care of me for any reason. If government assumes the job of taking care of us, then Congress can control just about every aspect of our lives. When I was a rebellious teenager, my mother frequently told me, "As long as you're living in my house and I'm paying the bills, you're going to do as I say." That kind of thinking is OK for children, but not for emancipated adults." Source: his April 27, 2016 column, posted at Townhall.com. UPDATE (4/27/16): Retitled from "A Thought about Government Needs." The Concord Coalition (CC), which educates the public about the causes and consequences of federal budget deficits, published a paper last Friday, April 22, 2016, that provides a comprehensive set of 10 key questions that voters may find helpful in discussing America's fiscal future with candidates. The 10-page paper is available in an Adobe (.pdf) format so you can hand it out to your friends. "The federal budget deficit is on the rise again and the nation’s debt remains on a long-term path that is unsustainable. Voters should expect candidates in this year’s elections to explain how they intend to deal with the huge challenges ahead. "Doing nothing would be the height of fiscal irresponsibility, could jeopardize our economy and undermine our position of global leadership. It would also burden our children and future generations with massive government debt. So what do the candidates propose? "Voters have a right -- and a responsibility -- to find out. "This is no time for vague rhetoric and petty partisan jabs; voters should insist on credible solutions -- the more specific, the better. "Some of those solutions won’t be easy because the problems go far beyond the simple “waste, fraud and abuse” we hear about so frequently in campaign speeches. Nor can we expect even strong economic growth alone to put the country on a sustainable path." To close the government's fiscal imbalance would you consider changes in all parts of the federal budget? If not, what parts would you target and what would you consider untouchable? Where does deficit reduction fit within your priorities? Could you identify some areas in the budget where you see opportunities for bipartisan cooperation on reform? How should the government curb the growth of its health care spending programs while maintaining or improving the quality of care? Social Security is projected to run increasingly large cash deficits as the population ages and more people qualify for retirement benefits. How should we address these shortfalls? Are there some examples of tax provisions favoring specific activities or categories of taxpayers that you would support eliminating? If so, would you favor using the resulting revenue to reduce federal borrowing, lower tax rates, or both? Are there federal programs that you consider clearly wasteful or subject to widespread fraud and abuse, and how much savings would you expect to recover by reforming or eliminating these programs? Spending caps over the next decade will reduce “discretionary” spending -- the money Congress approves on an annual basis for defense and many domestic programs -- well below the historic lows for each as a share of the economy. Should defense spending be reduced further, kept the same or increased? Should domestic discretionary spending be reduced further, kept the same or increased? What relationship do you see between getting our fiscal house in order and a strong economy? The questions seemed equally applicable to ask of presidential as well as candidates for Congress. If you don't have your Congressional representatives in your address book, just scroll down to yesterday's Growls, or use this link, since we provide links to Arlington County's representatives in the Senate and the House of Representatives, and a link to the Library of Congress to find the Internet addresses of all 535 members of Congress. To learn more about the mission and history of the Concord Coalition, click here. "Tax Freedom Day® is the day when the nation as a whole has earned enough money to pay its total tax bill for the year. Tax Freedom Day takes all federal, state, and local taxes and divides them by the nation’s income. In 2016, Americans will pay $3.34 trillion in federal taxes and $1.64 trillion in state and local taxes, for a total tax bill of $4.99 trillion, or 31 percent of national income. This year, Tax Freedom Day falls on April 24th, or 114 days into the year (excluding Leap Day)," according to the Tax Foundation. In Virginia, Tax Freedom Day was last Friday, April 22. See the map in the report to find Tax Freedom Day in your state. That's an improvement from 2014, when Tax Freedom Day in the Commonwealth was April 24. 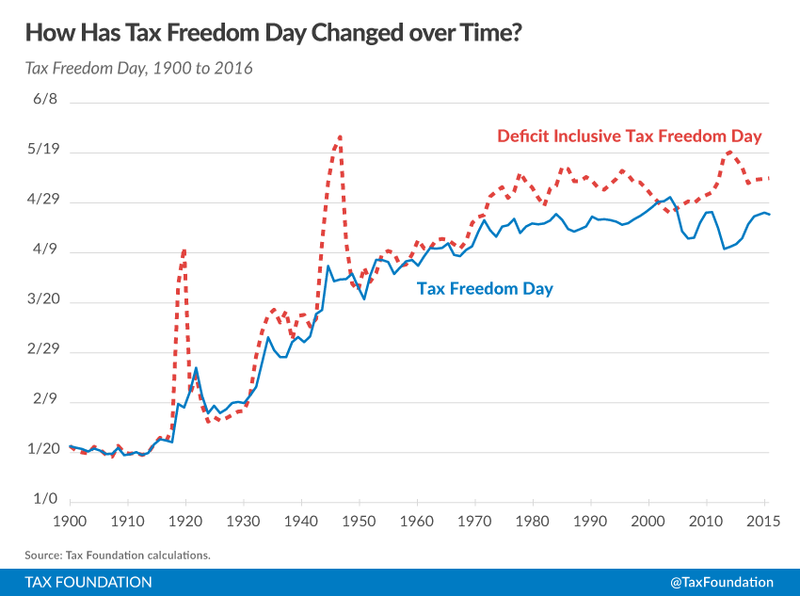 The Washington Post's Jonnelle Marte reported on Tax Freedom Day 2015, and Niraj Chokshi reported on Tax Freedom Day 2014, but a search at the newspaper's website turned up no comparable story for 2016. Fox News reported on Tax Freedom Day 2016 here, but that seems to the extent of reporting by the so-called "mainstream media." The story includes a clip featuring Neil Cavuto. Huffington Post includes an op-ed by the chief tax officer of Jackson Hewitt Tax Service here. At CNS News (here), Eric Scheiner provides coverage of Tax Freedom Day 2016. Coverage was provided, however, by "smaller market" newspapers, according to a Google News search. "The Center on Budget and Policy Priorities (CBPP) has just released their annual "refutation" of Tax Freedom Day, and their associated state groups will be forwarding it along shortly. We respond to their criticisms here. "However, there's an interesting concession they make in order to criticize Tax Freedom Day. 364 days of the year, CBPP and its allies claim that the tax code is regressive, that rich people don't pay enough, and that the tax code burdens low-income people more than high-income people. "But not today. In order to complain about Tax Freedom Day, they admit that the tax code is progressive, that rich people pay a lot, and that the tax code burdens high-income people more than low-income people. They even include a nifty chart for understanding ease . . . (see original post to see chart). "Turns out those bottom quintiles pay next to nothing after all, and that the federal tax system is pretty progressive. I'm glad CBPP can be straightforward about this, at least if only once a year." "I confess that I used to be much more skeptical of the Tax Freedom Day report. But now I think it does the body politic a great favor. In a democracy, we should know how much we’re paying for government. And while we can quibble with its method, the Tax Freedom Day report focuses our attention on the costs of government. It tells us that as a nation, we are working until late April to pay the bills. Actually, if you include the debt, we’re working until sometime in May. Right now, the Tax Freedom Day report is the only indicator of what government costs that is presented in a way that most people understand. That’s why it matters. "Most people have a difficult time connecting the costs and benefits of government. That is certainly true of the federal government, less so at the local level. But we should be discussing and debating the relative size of government and how much it costs. If taxes are the price to pay for civilization, maybe we would want a little less. Of course, maybe we would want more. "For me this issue resurrects one of the great failings in American political discourse. If you believe the government has a positive role to play in society, you should make that case to the public, while also explaining that the government you’re proposing costs money and will have to be paid for. For those folks, the response to the foundation’s report should be “yes, we are working until April because we want this level of government.” But then you need to be prepared when the answer is “nope, I’m not getting quite what I want from my government.” It’s a discussion worth having, and the Tax Freedom Day report should be the catalyst for it." From his past writings, David Brunori seems to take a much more effusive view of government, but I'm happy to learn that he desires to have a discussion of the cost of government. Information to contact Virginia legislators is available at our December 14, 2015 Growls. To contact Virginia Governor Terry McAuliffe, visit our April 20, 2016 Growls. And to contact members of the Arlington County Board, see yesterday's Growls. Kudos to the Tax Foundation for their efforts to provide Americans with the principles of sound tax policy. Does Arlington County Need Another Blue-Ribbon Panel? On Wednesday, April 20, the Arlington Sun-Gazette's Scott McCaffrey reported that members of the Arlington County Board sparred the day before about the "bailiwick of blue-ribbon panel." The panel would provide advice on "county-government priorities." "Board members backed the proposal by chairman Libby Garvey to impanel a six-member committee, which will spend the next eight months looking at “a process to get to a process” in developing a county-government strategic plan. "The panel – with one member appointed by each board member as well as one by the county manager – will report back on options for the county government to “make it clear what our real priorities are,” Garvey said. Currently, “we don’t have a way to prioritize,” the chairman noted. "Garvey had the backing of board colleagues Katie Cristol, John Vihstadt and Christian Dorsey. But Vice Chairman Jay Fisette – who ultimately voted in favor – publicly pecked away at the proposal, which he viewed as overblown. “I’ve heard the grumbling that we have no process and no vision,” Fisette said, dismissing it out of hand. “We do know, broadly speaking, where we’re going and what our values are,” he said. "Other board members suggested it was Fisette’s concerns, not the proposal itself, that seemed overblown." Despite the verbal sparring, the Board voted 5-0 to establish the blue-ribbon panel. In closing, McCaffrey wrote the Board got one surprise, however, writing, "In what appeared to come as a surprise to Garvey, County Attorney Stephen MacIsaac said that, under Virginia law, gatherings of the group must be open to the public, which might make it harder to recruit candidates for the six slots. Appointments are slated for May." "So is the launch of the “Blue Ribbon” panel only the start of a longer process? Or is it meant to unwind community priorities that have evolved over a great deal of time and through broad-based discussions? "Is this the beginning of an effort to examine the Arlington County budget holistically and establish a common-sense approach for setting budget priorities? Or is it just a way to play favorites? "Whatever the motives, violating the Board’s own prior notice requirements and launching a wide-ranging review without input from residents, businesses or community groups is wrong. It certainly isn’t the Arlington Way." Refer to his Right Note column for a more complete explanation of the four suggestions. We've always thought the process of adopting the annual county budget was a process that encompassed the setting of priorities. In fact, the International City/County Management Association seems to agree in something they refer to as "Priority Based Budgeting." "(Today) is “Earth Day” and by all indications the Obama administration intends to celebrate it by traveling to the United Nations in New York and signing the Paris Agreement on climate change. Despite the pomp and circumstance of a U.N. Headquarters signing ceremony, President Obama claims that the Paris Agreement is not a treaty. Since he claims it is not a treaty, he does not plan to submit the Agreement to the Senate for approval. "The problem is that the Paris Agreement is certainly a treaty. I reviewed enough treaties during my time in the Senate where I served on the Foreign Relations Committee to know. But don’t take my word for it. The State Department’s internal guidelines make clear that the Paris Agreement is a treaty. "Those guidelines, known as the “Circular 175” procedure, demonstrate that the Paris Agreement is a treaty. For example, the Agreement makes environmental commitments that affect the U.S. as a whole. The Agreement is formal and complex rather than informal and routine. The Agreement is open-ended and requires the U.S. to deliver untold billions of dollars to a “Green Climate Fund” for redistribution around the world to pay for “green projects” in foreign countries. These all indicate that the Agreement is a treaty and not a mere executive agreement, as the president claims. "I suppose the president and Secretary Kerry intend to save the planet without the help of the Senate. "The fact is the White House gave up the game about a year ago when it signaled it would bypass the Senate no matter what . . . ."
Source: his April 22, 2016 op-ed posted in the Washington Times. Links available in the original. Citizens Against Government Waste (CAGW) has named its March 2016 Porker of the Month, and he is -- drum roll please -- Senate Minority Leader Harry Reid (D-Nev.) " for his blatant blocking of a bipartisan bill designed to empower federal agency inspectors general in their battles against waste, fraud, abuse, and mismanagement." "Sen. Chuck Grassley (R-Iowa) introduced S. 579, the Inspector General (IG) Empowerment Act, on February 26, 2015. The bill ensures that IGs have access to all agency records for their investigations, as clearly stated in the 1978 Inspector General Act, which created presidentially-appointed IGs. When Sen. Grassley attempted to bring the bill to the Senate floor on December 15, 2015, Sen. Reid objected to the unanimous consent request, which would have allowed what should be a noncontroversial bill to pass on a voice vote. Sen. Reid then refused to fully explain to his colleagues why he blocked the measure, simply stating that he and other unnamed senators were “concerned about it.” Fellow Democratic Senator Claire McCaskill (D-Mo. ), a former state auditor, was dumfounded at Reid’s opposition: “There is no universe that the IG Act should mean anything less than what it says.” Sen. Reid again refused to detail his objections when he was questioned by reporters on March 18, 2016. "An August 5, 2014 letter from 47 IGs to the House and Senate oversight committees detailed how certain Obama administration agencies such as the Peace Corps in 2011, and the Environmental Protection Agency in 2013-14, skirted and obstructed investigations by IGs since 2010. Most notably, the Department of Justice (DOJ) Office of Legal Counsel granted the FBI veto power when the DOJ IG requested certain documents in a memo released on July 23, 2015. The IG’s straightforward message to the committees stated that “refusing, restricting, or delaying an IG's access to documents leads to incomplete, inaccurate, or significantly delayed findings or recommendations, which in turn may prevent the agency from promptly correcting serious problems and deprive Congress of timely information regarding the agency’s performance.”"
"For standing against accountability, transparency, and one of the taxpayers’ best friends in fighting waste, fraud, abuse, and mismanagement in the federal bureaucracy, CAGW names Sen. Harry Reid its March Porker of the Month." Not familiar with Citizens Against Government Waste? CAGW "is a nonpartisan, nonprofit organization dedicated to eliminating waste, fraud, abuse, and mismanagement in government." 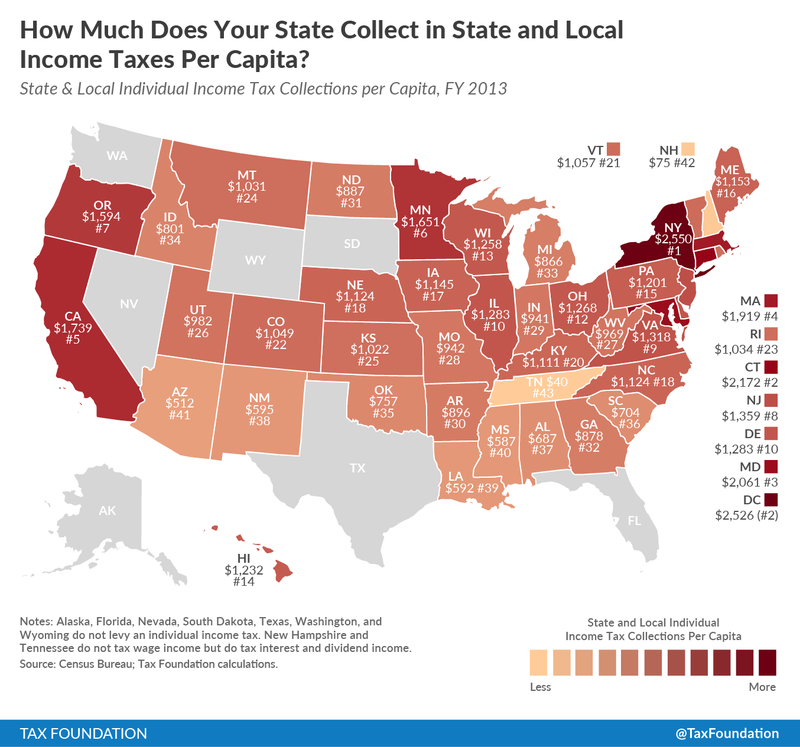 The Tax Foundation posted a map today showing the amount of "state and local individual income tax collections per capita." "Individual income taxes are the single largest source of state tax revenue in the United States, accounting for 36.5 percent of all state revenue in fiscal year 2013 despite the fact that nine states forego a tax on wage and salary income. Among states (and the District of Columbia) imposing an individual income tax on wage income, the tax accounts for an average of 43.4 percent of all state collections. "Income taxes tend to be less important to local governments overall, accounting for 4.8 percent of local tax collections. Over 91 percent of all state and local income tax revenue flows to state governments. Low collections at the local level is at least partly due, however, to their lesser ubiquity. They represent 13.8 percent of collections in the thirteen states (and the District of Columbia) permitting local income taxes, ranging from de minimus collections in Oregon to 31.7 percent of local revenue in Maryland. Local governments in six states—Indiana, Kentucky, Maryland, New York, Ohio, and Pennsylvania—generate more than 10 percent of their revenue from individual income taxation, as does the District of Columbia. "This week’s map shows state and local combined individual income tax collections per person in the 2013 fiscal year (latest available data). This category includes broad-based taxes on wage and salary income, as well as taxes on specific types of income, such as interest and dividend. Forty-one states have broad-based income taxes, while two (New Hampshire and Tennessee) only tax interest and dividend income. Seven states have no individual income taxes (Alaska, Florida, Nevada, South Dakota, Texas, Washington, and Wyoming)." We thank Jared Walcczak and the Tax Foundation for their continuing efforts in providing American taxpayers with quality tax policy research since 1937. A search at the Tax Foundation website found a similar analysis posted at the Tax Policy Blog by Liz Malm on May 28, 2015 with FY 2012 data that shows Virginia ranked #10. So, congratulations, Gov. Terry McAuliffe (D) for your help in raising Virginia's per capita collection of state income taxes from #10 to #9. Per capita collections increased from $1,254 in FY 2012 to $1,318 in FY 2013. It's an increase of $64 per capita for an increase of 5.1%. And tell him ACTA sent you. The lead editorial in today's Investor's Business Daily asked whether it's 'fair' that 45% of households pay no income tax. It seems an especially important question since 20% of households pay 88% of federal income taxes. "Democrats keep demanding that the rich pay their “fair share” of income taxes. But they never say what fair is. Probably because they know that the rich pay huge amounts while 45% of households pay nothing. "The nonpartisan Tax Policy Center has some eye-opening statistics on its site that should silence the “tax fairness” debate, if the numbers were widely known. "For example, did you know that the richest 20% of households pay 88% of federal income taxes? Or that this is up from 64.7% the year before Reagan took office? "Did you know that 45% of all households pay zero taxes? Or that most of these people actually get money back? Tax Policy Center data show that he poorest 20% of households have an effective tax rate of negative 7.5%, while the next poorest 20% face a rate of negative 1.3%. "Ah, the argument goes, but the rich have gotten all the income gains over the past 35 years, so of course their share of income taxes has gone up. The problem is that the share of income accounted by the top 20% has climbed just 7 percentage points since 1980, while their share of income taxes went up by more than 23 points. "The argument continues that these numbers don’t account for payroll and other taxes the poor pay. Yet even when you combine all of these, the average effective tax rate for the poorest among us is a mere 1.9%, while the rate for the wealthiest climbs to 23.4%, Tax Policy Center data show. "The bigger problem with all the talk of “fairness,” however, is that it is a completely undefined term. We've growled frequently about paying a 'fair share' of taxes. The first time was on October 28, 2004, when we growled about the frequency that 'fair share' was used in the presidential primaries. In our most recent Growls on March 4, 2016, we quoted GMU economics professor Walter E. Williams who explains what you might want to ask the next person you hear saying the rich do not pay their 'fair share.' Use our search facility to find others. The IBD editorial links to two helpful sources. The first (here) is a Tax Policy Center table of tax units with zero or negative income tax while the second is a Statista interactive chart (here) shows the "shares of household income of quintiles in the United States from 1970 to 2014." Arlington County Board Tells Taxpayers: We Have Needs! ARLnow.com, the local news portal, confirmed in a post this morning that the Arlington County Board will ignore the recommendation of an Arlington County Civic Federation resolution that urged the Board to cut the real estate tax rate a full-cent rather than the 1/2-cent cut that was in the County Manager's proposed FY 2017 budget. For details on the Civic Federation's resolution, see our April 6, 2016 Growls. "The Arlington County Board on Tuesday is expected to approve a half-cent reduction in the real estate tax rate. "The Board will consider tax rates and the annual county budget on Tuesday. A staff report published in advance of the meeting suggests that the Board has settled upon a tax rate reduction. “After a lengthy public review process that included work sessions, public hearings, input from residents, employees, boards and commissions, and updated revenue forecasts based on FY 2016 mid-year and third-quarter updates, the County Board, after deliberations, has approved an FY 2017 budget that is balanced at the real estate tax rate of $0.978 per $100 of assessed property value,” the report says. "That will bring the residential tax rate to $0.991 per $100 in assessed value, including the $0.013 stormwater rate." ARLnow.com links to the Board report (Agenda Item 48.B. on the Board's April 19 recessed meeting). "County Board Chairman Libby Garvey appears to be tiptoeing away from a goal of cutting Arlington’s real-estate tax rate more than the half-cent proposed by County Manager Mark Schwartz. "In an April 6 appearance before the Arlington County Democratic Committee, Garvey said she expected the tax rate to be cut from its current 99.6 cents per $100 assessed valuation to 99.1 cents, as proposed by Schwartz." Well, at least we now know which political organization runs the county's fiscal affairs. To find out all those so-called unmet needs the Board had to meet, spend some time watching the Board make their final budget decisions/mark-up budget work session on Thursday afternoon, April 14, 2016. "Our current obsession with the presidency as being the most important election and the one that attracts the most voters has caused people to forget that this office is the least democratic. If people really want to exercise their will, they need to do it through their state representatives and senators. The office of the presidency is a different matter. "Gerry wasn’t calling the voters stupid. He was recognizing the fact that groups of people on a grand scale can be manipulated through propaganda and emotional messaging. To guard against this, the framers decided to select delegates not as proxies but as representatives. Chosen by their peers at the local level, delegates are supposed to be more informed, aware of the process, and committed to obeying the rules. Their role is to bring stability to the process. Source: her April 13, 2016 essay, entitled "There's a Reason We Live in a Republic," posted at Conservative Review. In an article, dated December 5, 2014, at e21, the economic policies project of the Manhattan Institute free-market think tank, Diana Furchgott-Roth wrote about the effort by fast food workers and others to raise the minimum wage from its current $7.25 per hour. She added, "Leading the strikes were the Service Employees International Union and its worker center, Fast Food Forward, also known as Fight for 15, which called for $15 an hour wages and a union." Arlington County has a minimum wage although it's called a "livable wage," but it pertains only to county contracts. The living wage policy "is covered in §4-103 of the Arlington County Purchasing Resolution," further discussed here. The policy notes that not all contracts are covered. The hourly rate was $13.13 effective July 1, 2012. We growled about the county's living wage, which is nothing more that a minimum wage on steroids, on April 4, 2016 after Governor Terry McAuliffe vetoed HB 264, which would "prevent local governments from compelling employers to pay more in wages or benefits than required under state and federal law." We also growled about the "living wage" on March 11, 2012. "The next labor market battle in both the United States and Europe will be over the “living wage.” Long backed by both unions and progressive groups, the living wage looks like an old-fashioned minimum wage, with a critical twist. The national minimum wage, currently $7.25 an hour (up from $5.15 in 2006), applies to a wide range of workers in the public and private sector. In contrast, living-wage laws target only individuals who work in projects that get some sort of government subsidy . . . ."
When the Arlington County Manager released his proposed FY 2017 budget, the Arlington Sun Gazette reported on February 19, 2017 about the Manager's plan to "impose (a) higher 'living wage.'" The hourly rate would be increased to $14.50. County employees: The new $14.50 hourly rate would affect 7 permanent employees and 268 temporary employees. The estimated incremental cost would be $200,000. Arlington Public Schools: The $14.50 rate would affect a mix of 150 permanent and hourly employees, broken down this way: 31% extended day; 55% food service; and 14% maintenance. The estimated added cost would be $150,000. So, the County Manager raises the "living wage," which will cost Arlington County taxpayers upwards of $350,000, but the Arlington County Board may not be able to increase the Manager's 1/2-cent real estate tax rate cut to a full 1-cent, but likely manages to pay for a lot of requests from the special interests. Guess the County Manager is just fulfilling the County Board's adopted motto of the county being a caring community. See also our April 5, 2016 Growls. So, does a 'living wage' make even less sense? And the County Board wonders why many think Arlington County isn't business-friendly. So, while the County Board has provided several million dollars to the county's economic development department, they do things to be less business-friendly. Who is conflicted? Is the Arlington County Board merely channeling California Governor Jerry "Moonbeam" Brown (D)? It's April 15. Why Weren't Your Taxes Due Today? It's April 15, and you don't have to file your federal income taxes until Monday, April 18. What's going on, you ask? Well, the Tax Foundation provided the answer on Tuesday at their Tax Policy blog. "Betsy Ross made the first U.S. flag, Abraham Lincoln freed the slaves, and Tax Day is April 15. These American immutable truths are being thrown a curveball this year, because the day that Americans must timely file their federal income tax returns for 2015 is April 18, 2016, three days later than usual. "The reason is Emancipation Day, which celebrates Lincoln's freeing of 3,100 slaves in the District of Columbia on April 16, 1862, nine months before he signed the Emancipation Proclamation. DC began celebrating it a few years ago and as a legal holiday, gets precedence over the tax deadline. This year, since the holiday falls on a Saturday, it will be observed on Friday, April 15. That means Tax Day is Monday, April 18. "In Maine and Massachusetts, taxpayers get an extra day because of Patriots' Day, a holiday this year celebrated on April 18 to honor the Battles of Lexington and Concord on April 19, 1775. (Maine used to be part of Massachusetts so it celebrates the battles too.) The federal filing deadline for taxpayers in those states is Tuesday, April 19, although any estimated tax payments are still due on April 18. (This was all clarified by a recent IRS revenue ruling.) This is also impacts extension deadlines - taxpayers using a 6-month extension will have a deadline of October 17, 2016. "Tax Day wasn't always April 15th (or 18th). When the income tax first came into effect, the filing deadline was March 1 (starting in 1914 for the 1913 tax year), then moved to March 15 in 1919, then to April 15 in 1955." Henchman links to the IRS tax deadline alert here. Kudos to the Tax Foundation. To learn more about the Tax Foundation, check here. In the commentary section of today's Washington Times, Cal Thomas writes,"Just in time for Tax Day comes the annual Pig Book 2016. For more than two decades Citizens Against Government Waste, a nonprofit organization that, according to its website, advocates for the “the elimination of waste and inefficiency in government through lobbying and grass-roots activities,” has published this useful guide, which illustrates just some of the ways our elected representatives waste the money we send them." Thomas provides several examples of Congressional pork, including the following one, which features the "King of Pork:"
At the moment, the Citizens Against Government Waste (CAGW) website is down -- I'm getting an Internal Service Error. In the meantime, Cal Thomas' column will have to suffice, but I will update Growls with a link to Pig Book 2016 when the website comes back up. A Pared-Down Aquatics Center in Arlington County's Future? At an Arlington County Board work session yesterday, the County Manager "resurrected planning for the Long Bridge Park aquatics center, offering a proposal that cuts the size of the facility more than 35 percent and makes inroads into high construction and operating costs that sunk an earlier incarnation of the plan, according to an online report this morning by the Arlington Sun Gazette's Scott McCaffrey. "Schwartz’s proposal, detailed to County Board members, calls for a 73,000-square-foot complex – down from 116,000 square feet – that would cost $40 million to $44 million to build (not including design, project-management and contingency fees). "That’s well below the construction cost of the facility as first proposed, but it comes with cuts to the original plan. A therapy pool has been eliminated in the new incarnation; the original separate teaching and family pools have been combined into one; spectator seating has been whacked by more than half; one of two meeting rooms is now gone; and energy-efficient design elements have been banished to a list of options. “We’re on track with a scaled-down version,” County Board member Katie Cristol said after the briefing. "Cristol said while there may not now be unanimity among board members to move forward, she believes there is “more than a 50-percent chance” the aquatics center will see the light of day. We've growled often about this County Board vanity project, most recently August 14, 2015 and March 20, 2015. On December 31, 2014, we growled about the County Board's 10-year record of profligacy. The news release tries to argue that the proposed $64 million aquatics center will meet "core community needs." The Arlington County Civic Federation recently passed a resolution by a vote of 63-1-1 urging the county to acquire an average of three acres per year for 10 years. That seems to be more of a core community need than does a vanity aquatics center for a relatively difficult to access place such as Long Bridge Park. Not to mention the likelihood the Arlington Public Schools will need a 4th high school, which we growled about just last Thursday. The news release includes links to both the staff presentation of the proposed revisions and "the history of the County’s development of Long Bridge Park, located in Crystal City along the Potomac River." In addition, it contains details of the "plan to replace the aging Lubber Run Community Center at 300 N. Park Dr., with a multi-use community center." "Vihstadt’s victories in both a special election and the general election that year convinced Democratic County Board members Jay Fisette and Mary Hynes to reverse their support for the Columbia Pike streetcar (another big-ticket project targeted by fiscal hawks), derailing the five-mile, $300-million transit project. County leaders also killed off the Artisphere art center and scaled back the cost of high-tech bus stops on Columbia Pike. "After Donnellan put the aquatics center on hold, some held out hope that the Washington area would win the 2024 Summer Olympic Games, providing the project a new raison d’etre. But the somewhat lackadaisical D.C. bid for the Olympics didn’t even make the final cut among U.S. cities. "For most of the 20th century, the site on which Long Bridge Park sits hosted industrial uses. The county government was able to trade land it owned elsewhere in Crystal City to acquire much of the site, then worked to remediate the ecological problems in order to make use of it as parkland." "Elections are not held to make us feel good at the time, but to select someone with the depth of knowledge and character to be entrusted with our lives and the future of the nation." HT His 4/12/16 column at Townhall.com. The Washington Free Beacon's Ali Meyer reported last week on the General Accountability Office's (GAO) release of their annual review of the federal government's financial statements, and included testimony by the Comptroller General, Gene Dodaro, before the Senate Budget Committee. Her report included the following"
"Dodaro says that under current law, debt held by the public will hit a historic high. "Another economic projection which assumes that cost controls for Medicare don’t hold and that healthcare costs continue to increase, shows debt rising even further. "The audit also called into question the reliability of the government’s financial statements. According to the report, if a federal entity purchases a good or service, that cost should match the revenue recorded by the federal entity that sold the good or service. The report found that this was not always the case and found hundreds of billions of dollars in differences between transactions between federal entities." You can access GAO's report, entitled, "FISCAL YEAR 2015 U.S. GOVERNMENT FINANCIAL STATEMENTS: Need to Address the Government's Remaining Financial Management Challenges and Long-Term Fiscal Path," here (both the 1-Page Highlights and 45-Page Full Report). This GAO report is primarily the Comptroller General's written testimony to the Senate Budget Committee. The Comptroller General's formal report was transmitted to President Obama, President of the Senate, and the Speaker of the House of Representatives on February 25, 2016, and included the "U.S. Government's Fiscal Years 2015 and 2014 Consolidated Financial Statements," a 286-page document (GAO-16-357R). “I wouldn’t use the word ‘technical insolvency’,” said Robert Dacey, GAO’s chief accountant, when CNSNews.com asked him whether the federal government was technically insolvent because its liabilities were seven times larger than its assets and its “total net position” was $18.2 trillion in the red. “Negative net position isn’t normal, but the federal government still has the ability to tax, and there are a lot of other resources [i.e. national parks] that are not recorded” on its consolidated financial statement, he told CNSNews.com. 'However, Dacey agreed with the comptroller general that the current financial condition of the federal government is unsustainable over the long term. "Unmanageable, unsustainable, unreal – choose your adjective, because they all describe our debt. In the near future, that debt will inevitably lead to an economic disaster. And as long as the voices that say the debt doesn't matter, or the situation isn't that dire, continue to be heard in Washington, very little will be done to save us from catastrophe." There is little reporting on the GAO report by the mainstream media's newspapers, according to a Google search. However, we did find several items in what some call the alternative media. "The head of the government's main internal watchdog agency said the Pentagon's inability to clean up its books and account for its property remains a major reason the federal government cannot pass an audit." "Even though the GAO could not express an opinion about the accuracy of the financial report, Dodaro said it showed the government's budget path was still unsustainable in the long run. To keep the debt in proportion to the U.S. economy stable over 75 years, he said, revenue would have to be increased by 35 percent annually or spending cut by 26 percent on the same basis." In case you need to stop for some lighter reading, the blog Going Concern provides a humorous take on the the GAO report and the consolidated statements. "Weinberg told The Daily Caller News Foundation it’s “unfathomable” the government gets away with flunking audits every year. “The federal government is the largest financial organization in the world, so you hope that it would be the leader in having its books clean and not flunking its audits,” she told TheDCNF." Unfortunately, even Capitol Hill's newspaper, The Hill, gave the GAO report short shrift. "Senate Democrats on Wednesday couldn't agree that federal debt is a national security problem, in a hearing aimed at assessing the long-term strategic implications of the government's $19 trillion debt. "A realistic discussion about it, and accepting expert opinion that this debt that we have is not actually right now a threat to our country, is I think a more realistic and honorable way of talking to the American people about it," Sen. Ed Markey, D-Mass., said during a Senate Foreign Relations Committee hearing on Wednesday. "That surprised committee chairman Bob Corker, who concluded the hearing by describing such views as "crackpot," and repeatedly said he expected the panel to demonstrate consensus about the need to limit the debt. Markey also insisted that Republicans drop their interest in changing entitlement programs as they try to mitigate the projected federal debt. "Budget hawks long have warned about a brewing debt crisis, a concern that gained currency in military circles in recent years. "I've said many times that I believe the single, biggest threat to our national security is our debt, so I also believe we have every responsibility to help eliminate that threat," Navy Adm. Mike Mullen, then-chairman of the Joint Chiefs of Staff, said in 2011. "Markey suggested that nuclear weapons represent one of the top targets for such debt reduction. "There's a proposal to [spend] $1 trillion of new nuclear weapon systems in our country over the next 20 years," he said. 'That's a crazy number from my perspective.'" "Not all Democrats agreed with Markey's views. "I don't want you to leave with the impression that the Democratic side of this committee is insensitive to the deficit. We're not," said Maryland Sen. Ben Cardin, the ranking Democrat on the panel. "I think Democrats are very concerned that there be adequate revenues in order to be able to make the investments that we think are important for the growth of our nation." "I think Republicans are very concerned that we don't hide the costs of spending, particularly on mandatory spending, and that we have a reasonable foreseeable, affordable programs in the future," Cardin added. "And I think we can listen to each other and learn from each other and pass a blueprint that would not only provide for the economic growth of our country but deal with the security issues ... large uncontrollable debt can compromise America's security, no question about it." So, is it any wonder that Congress's poll ratings are so low? The Federalist Society blog, this past Monday, reported on the move of 19 state Attorney Generals "to conduct concerted state regulatory action against the fossil fuel industry, the American Legislative Exchange Council, and unknown, unnamed others described as climate change deniers." For the record, over the last nine or ten years, we've growled perhaps 100 times about global warming, or as the warmistas prefer calling it now, climate change, so it's possible ACTA is among the "unknown, unnamed others described as climate change deniers." Our earliest Growls about global warming was posted February 12, 2006 followed by a January 6, 2007 Growls noting that the Arlington County Board had jumped into bed with the global warming alarmists. "The announcement represents an alarming escalation of the Martin Act investigation against Exxon Mobil begun last fall by New York, and a similar investigation by California – both right on cue with the next presidential election season. This time, seven AGs gathered behind an “AGs United for Clean Power” banner, along with their “rock star” celebrity spokesman, Al Gore, to level charges of fraud, deceit and racketeering about “what energy companies knew about climate change and when did they know it.” Gore went so far as to attribute recent natural disasters such as Hurricane Sandy and a storm in the Philippines -- and even the movement of the Zika virus and its impact on human reproduction – to climate change. Not to generate hysteria, or anything. "Pitching themselves as David vs. the energy industry’s Goliath, these state AGs acknowledged that they were departing from their usual practice of quiet investigation followed by regulatory action based on the results. Nearly every speaker expressly cited the state AG’s successful victory over the tobacco industry as a template for this action. One AG called upon other countries, states, communities and individuals to join in this effort. Why the public announcement before the facts come in? Why the global call to arms by this minority of state AGs? "An alert observer will recognize that this press conference follows right on the heels of drastic fiscal crises in many states. The state AG’s wildly successful settlement with the tobacco industry in the 1990s –which incidentally also deployed foreign countries, dissenting states, cities, towns and health insurers to amass industry-busting claims– shifted a quarter of a trillion dollars to the states and their attorneys, leading to fiscal and governmental bloat that, to borrow a term from the climate activists, is unsustainable. New targets need to be identified and demonized so that this state regulatory confiscation from private industry can continue. "It is therefore encouraging to see that the majority of the fifty states -- twenty-nine in all – followed the next day with a press release that they would not be joining in the effort. Those state AGs recognize the dangers to the core values of respect for the rule of law and free speech posed by this coalition. They recognize that good science embraces disagreement and the chilling effect on research when the government decides what is “truth” and what is “fraud” in what is in fact an ongoing scientific debate. "The most effective way to silence debate is to launch an inquisition of those who disseminate opposing views, exposing them to investigation and charges of fraud and racketeering. All American citizens, whatever their views on the merits, should be deeply concerned about the actions undertaken by the nineteen states joining forces not only to duplicate the tobacco heist but to suppress free speech and the fearless discussion of an area of vitally important scientific inquiry. A robust examination of the forces that have combined to organize this inquisition is in order." Margaret Little, the Federalist Society blogger, ended her post by providing links to several background pieces, including opinion pieces and an editorial.The link, again, is here. CNS News, article dated March 29, 2016, discussing the formation of "a first of its kind partnership of law enforcement officials" to combat climate change. The article noted that Virginia AG Mark Herring would be joining the "partnership;"
Power Magazine article by associate editor Sonal Patel, dated March 30, 2016, quotes "Teri Donaldson, a partner with DLA Piper and a former federal prosecutor" who warns, "There are potential consequences that are not only expensive in terms of defending an investigation, but there is also the potential for criminal penalties for your inability to have an accurate crystal ball, and I think that’s really alarming." During 'New Business' at Tuesday evening's Arlington County Civic Federation meeting, the Revenues & Expenditures (R&E) Committee put into play a resolution that urges the County Board to set-aside one-third of the end-of-year closeout, or surplus, to reducing real estate property taxes (see agenda here). "The Arlington County Civic Federation next month will debate whether to call on the county government to refund up to one-third of its annual surpluses to taxpayers. "The proposal, introduced at the organization’s April 5 meeting and backed by its revenues-and-expenditures committee, targets the $20 million to $40 million annually that the county government has as a surplus – funds left over at the end of the year and not allocated to any future expenditures. "At the end of the county government’s 2015 fiscal year last June, there was an available closeout balance of just under $22 million. Had a third of that been taken for tax relief, it could have resulted in an approximately 1-cent reduction in the real estate tax rate – which would have put about $60 back in the pockets of a typical homeowner. "Before the Civic Federation’s membership debates the issue in May, the proposal will make the rounds of various committees for input." The proposed resolution has not been added to the Civic Federation's website, yet. Arlington County citizens do not need to be Federation delegates in order to attend the Federation's monthly meetings, however, only delegates can vote on Civic Federation business. In reviewing aspects of the County Manager's proposed FY 2017 budget, members of the R&E committee determined that Arlington County "closed out" fiscal years 2011-2015 with a total of $145.1 million of General Fund balances, or an average annual surplus of $29.1 million. So rather than making the funds available to the County Board for so-called "one-time" spending, or parked away in one or more reserve or contingent funds, committee members think it's time to give Arlington County taxpayers a 'fair share' of the money. After all, they earned it. So, mark your calendars for the Tuesday, May 3 meeting at 7:30 PM at Virginia Hospital Center's Til' Hazel Auditorium. The first program item on the agenda will be an update of the 2016 General Assembly session by the Assembly's Arlington Delegation. More information is available at the Civic Federation's website. "We must not let our rulers load us with perpetual debt." HT Founders' Quote Database, The Patriot Post. Is a 4th High School in Arlington County's Future? The Arlington Sun Gazette's Scott McCaffrey reported yesterday that "a proposal for fourth Arlington high school (is) still a work-in-progress." McCaffrey's report resulted from comments made by Arlington School Board members during their April 5 meeting with the Arlington County Civic Federation. "The issue “is looming large,” acknowledged School Board member Reid Goldstein during an April 5 meeting with the Arlington County Civic Federation. "County school officials anticipate the current boom in enrollment, which has seen facilities buckle (figuratively at least) under the weight of more than 26,000 students this year, will only continue, and will soon hit middle schools hardest before marching on to high schools – all of which currently are straining at or above capacity. "Washington-Lee recently underwent an upgrade to improve capacity, while expansions to Yorktown and Wakefield are on the horizon. Still, it may not be enough. "At some point, we will need a fourth high school – the question is when,” said School Board member James Lander." Given the tens of millions of dollars the Arlington County Board has been pouring into so-called affordable housing, the eventual need for a fourth high school shouldn't be a surprise. According the the January 2016 annual enrollment projections report, published by the Arlington Public Schools, annual enrollment in 1961 was just over 25,000, but then over the next 25-30 years, it slowly dropped to just under 15,000. Beginning about 1990, it began a slow rise, reaching 19,097 in September 2001. From 2001 to 2006, enrollment remained relatively flat, but beginning September 2007 when enrollment was 18,684, enrollment began a faster climb. Since September 2007, enrollment has grown to 25,238, a spurt of 35%, or an annual increase of 4%. The report projects a total PreK-12 enrollment of 31,893 during the 2025-2026, an increase from the current school year of 25.7%, or an annual increase of almost 2.6%. Earlier this evening, an e-mail from the Arlington County Board came over the transom. It was a "public notice" advising recipients the County Board would be holding a work session on Tuesday, April 12 at 7:00 PM with the Manager "for the purpose of discussing the proposed Long Bridge Aquatics and Fitness Facility and the proposed new Lubber Run Community Center." Now I know both the County Board and School Board like to think they can promise everything since economic laws don't apply to their government, but Arlington taxpayers know better. In an online story posted at noon today, the Arlington Sun Gazette reported "The Arlington County Civic Federation is pressing the county government to slice just a little bit more off the real-estate tax rate." "Delegates voted 22-14 April 5 to support a resolution calling for a cut of 1 cent off the existing rate of 99.6 cents per $100 assessed value. That would be a half-cent more than the cut proposed by County Manager Mark Schwartz. "The penny-cut proposal came from the federation’s revenues-and-expenditures committee, which long has been a bastion of fiscal conservatism within the organization. The vote took place after not a single delegate opted to speak for or against the idea – a rarity at Civic Federation meetings. "Cutting the tax rate to 98.6 cents per $100 can be accomplished “with little if any impact” to the billion-dollar county budget, said Burton Bostwick, who sits on the committee." "A one-cent cut in the tax rate would equate to a $50 savings for the owner of a home assessed at a half-million dollar, and would cut about $7 million from the county government’s coffers. "The proposal is “certainly responsible,” said Arlington County Taxpayers Association president Tim Wise, who sits on the revenues-and-expenditures committee and would have supported a greater cut if it had been offered. "Under Schwartz’s proposed fiscal 2017 budget, the typical Arlington homeowner will see a total cost for local taxes and fees of $7,859 this year, up about $219 from a year before. Over the past five years, the average tax burden has grown $1,113. "Restraining the growth would be a benefit to the public, said Suzanne Sundburg, a Civic Federation delegate who supported the proposal. “Taxes do push up the cost of housing – to renters as well as homeowners,” she said." Scroll down to the second page of the resolution for the source. The report accompanying the resolution has not been posted, yet, at the Civic Federation website. When it is, you'll see the many sources available to "pay for" the full 1-cent cut. We'll update this Growls when the accompanying report is posted to the Civic Federation website. "Gov. Jerry Brown, casting a living wage as a moral imperative while questioning its economic rationale, signed legislation Monday raising California’s mandatory minimum to $15 an hour by 2022, acting within hours of a similar bill signing in New York." "Brown, a fiscal moderate, had previously expressed reservations about a wage increase. But amid growing concern about income inequality in California and the national thrust of the labor-backed “Fight for 15” campaign, his hand was forced. Public opinion polls showed strong support for increasing the state’s mandatory minimum beyond its current $10. "The compromise Brown offered lawmakers – then celebrated with a bill-signing in Los Angeles – includes a provision allowing the governor to postpone a wage increase in the event of an economic downturn. It replaces a ballot measure that, if passed, would have raised the minimum wage to $15 by 2021, a year faster. “Morally and socially and politically, they (minimum wages) make every sense because it binds the community together and makes sure that parents can take care of their kids in a much more satisfactory way,” Brown said." "Republicans and business groups warn that the move could cost thousands of jobs, while a legislative analysis puts the cost to California taxpayers at $3.6 billion a year in higher pay for government employees. "A $15 base wage will have "devastating impacts on small businesses in California," Tom Scott, executive director of the state branch of the National Federation of Independent Business, said in a statement. "Ignoring the voices and concerns of the vast majority of job creators in this state is deeply concerning and illustrates why many feel Sacramento is broken." "Democrats who control the Legislature approved the increase Thursday, days after the agreement was announced. The measure passed with no Republican support. "The bill will bump the state's $10 hourly minimum by 50 cents next year and to $11 in 2018. Hourly $1 raises will then come every January until 2022, unless the governor imposes a delay during an economic recession. Businesses with 25 or fewer employees have an extra year to comply." "Why don’t those who support minimum wage, ever bring up the lower skilled workers who will only find the road to unemployment?" The radio talk show hosts also like to point out how you can tell if politicians are lying about the economic benefits of a higher minimum wage. They argue that if a higher minimum wage was such a magical economic solution, wouldn't they implement the entire minimum wage increase in one fell swoop? Instead, as in California the governor and legislature will not fully implement it until 2022. In an e-mail, a libertarian friend reminds that "a minimum wage job is a first step, not a destination," adding, "It’s for the child, not the parent. If someone’s a parent in a minimum wage job, the fault is theirs for not learning a value-added skill that earns more in a competitive marketplace. And on their parents for not teaching them better." He also wrote, "Freedom means the freedom to fail as well as too succeed." Another friend advises, "Get ready for the food robots!" We've growled frequently about the minimum wage, or the so-called living wage, i.e., the minimum wage on steroids. Use our search facility to find them. The online InsideNova.com, parent of the Arlington Sun Gazette, reported this morning that "Gov. McAuliffe has vetoed a pair of bills aimed at restricting the ability of localities to require those doing work with them from paying employees more than the current federal and state minimum wage of $7.25 per hour." "Both measures passed the General Assembly on largely party-line votes, with Republicans supportive and Democrats opposing, but the margins were not large enough to override a veto when the legislature returns to session April 20. "The political back-and-forth in Richmond does not, however, answer the basic question of whether living-wage requirements on contracts are in fact legal under Virginia law. "Fairfax County officials a decade ago looked into the issue and determined they did not have authority to force a living-wage requirement on contractors, absent authority from the General Assembly. "While neighboring Arlington County imposes such a requirement – contractors receiving more than $100,000 a year from the county must pay their workers at least $13.13 per hour – the Arlington Chamber of Commerce has long contended doing so violates state law. "The matter has never been fought out in the courts, however, perhaps because contractors are fearful of incurring the wrath of government procurement officials." "It’s going to be an interesting veto session. "Gov. Terry McAuliffe has rejected some of the General Assembly’s most controversial bills — which also happen to be some of the Republican majority’s most favored bills. "- A bill that would prevent local governments from compelling employers to pay more in wages or benefits than required under state and federal law. Charlottesville and the University of Virginia have in the past boosted their pay rates for employees to something approaching a “living wage,” but such actions have no effect on private businesses. Some activists want localities to mandate higher wages for private industry as well. Opponents see this as an affront to private decision-making." "Alexandria adopted a Living Wage Ordinance 15 years ago, which requires contractors who do business with the City to pay employees a “living wage”. Alexandria’s Living Wage is currently $13.13 per hour. City Manager Mark Jinks proposed raising this Living Wage by $1 per hour to $14.13 in the fiscal year 2017 budget he submitted to City Council on Feb. 23. "Members of City Council were aware of the General Assembly’s bill and urged the governor to veto it." Roanoke's WSLS channel 10's report includes Gov. McAuliffe's entire veto message. House Bill 264 was patroned in the House of Delegates by Rep. Glenn R. Davis (R-Virginia Beach). The co-patron was Rep. Michael J. Webert (R-Marshall). Access HB 264 here. According to Arlington County's Purchasing webpage, the county's so-called living wage policy can be accessed here. It shows the hourly rate was increased from $12.75 to $13.13 effective July 1, 2012. So, Alexandria plans to raise their "living wage" by $1.00 per hour while Arlington County, in its wisdom, plans to raise its "living wage," which is nothing more that the minimum wage on steroids, by $1.33 an hour. Isn't it wonderful to know the extent that government knows better than the market? Not to mention, of course, the extent these two most liberal governments in Northern Virginia might be colluding on setting wage rates. Nor the degree the "living wages" increase total county expenditures. According to an editorial last Sunday in the Pittsburgh Tribune-Review, "On the sixth anniversary of President Obama signing the ObamaCare law and saddling the nation with its regulatory diktats, here's a disquieting statistic that won't be trumpeted: $55 billion in waste and counting." $1.2 billion in startup loans for ObamaCare's 12 (out of 23) failed insurance co-ops. $1.5 billion in failed or unrealized state-run health exchanges — and not one of the remaining 14 is fully functional, according to a government audit. An estimated $45 billion for the 165 million hours that businesses and individuals spent trying to comply with ObamaCare's 106 new regulations. $750 million in public subsidies to more than 500,000 people who weren't eligible for coverage. $3.5 billion diverted from the Treasury to insurance companies to help cover their losses. "For all the happy talk about gains in the public's insurance coverage (except, of course, for the unfortunate folks who signed up with one of the government's failed insurance co-ops), the reality is a burgeoning, unsustainable government bureaucracy that is on pace to cost considerably more." Her story is worth reading in its entirety. At Corruption Chronicles, Judicial Watch's blog, we learn the Department of Homeland Security (DHS) wants another $1 billion even though the "'deeply troubled' DHS system blows millions." "Years after the U.S. launched an automated Homeland Security system essential to keeping the nation safe, it’s a malfunctioning flop that’s so far swallowed a mind-boggling $1.7 billion and needs an additional billion and several more years to perhaps get it to work. That’s not even the best part. A number of federal audits have documented the serious problems with this costly failure in the last few years and officials at the Department of Homeland Security (DHS) have simply ignored the government investigators’ findings and recommendations. "In fact, the agency watchdog writes that he’s “perplexed at USCIS’s non-concurrence,” which he points out is not rational, is contrary to department policy and suggests continued effort to promote disagreement rather than collaboration towards the shared goal of bolstering effectiveness and efficiency in agency operations. Despite this blatant negligence, the cash hasn’t stopped rolling and now DHS claims it needs another three years and an additional $1 billion if there’s any chance of getting ELIS to work properly. In its current form, the automated system “lacks critical functionality,” isn’t “user-friendly,” and has “significant performance problems” processing cases, according to investigators. Until the agency makes all the needed improvements—and there are many—it will be unable to meet its national security goals, the IG report affirms." The blog post continues, "ELIS has been a disaster from its inception yet continues to get taxpayer dollars . . . Since it was created by Congress to protect the nation from terrorism after the 9/11 attacks, DHS has wasted hundreds of millions of dollars on all sorts of outrageous experiments that have failed miserably. Among them is a highly touted system that was supposed to spot terrorists at airports. It was called Screening of Passengers by Observation Techniques (SPOT) and it burned through a ghastly $878 million in six years before the agency finally pulled the plug last year because it proved repeatedly to be useless . . . ."
"It is proper here to remark, that the authority to lay and collect taxes is the most important of any power that can be granted; it connects with it almost all other powers, or at least will in process of time draw all others after it; it is the great mean of protection, security, and defense, in a good government, and the great engine of oppression and tyranny in a bad one." HT Page 211, "As Certain as Death: Quotations about Taxes," Compiled and Arranged by Jeffrey L. Yablon, 2010 Edition, posted at TaxAnalysts.com.